Sorry, this job expired on Feb 3, 2018. Below are other jobs that may be of interest to you. 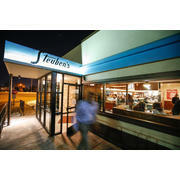 Steuben’s Arvada is seeking sous chef candidates for Ralston Rd location. Steuben’s is one of three concepts from Secret Sauce F&B, the locally-owned, independent restaurant group based in Denver. Our first restaurant, Vesta, opened in 1997 in the Lodo area of downtown Denver. Steuben’s first location followed in 2006 and quickly gained great popularity with its regional American menu, award-wining classic cocktail program, and eye-catching design. Ace Eat Serve, a multi-use eatery consisting of Asian restaurant, ping-pong hall, event space, plus patio and bar, opened in 2012 next door to Steuben’s. In early 2016, Steuben’s opened its second location on Ralston Road in Arvada, CO., another neighborhood with great history that welcomes an evolving restaurant scene. The ideal applicant has previous kitchen management experience as well as experience working professionally and productively in every station of a kitchen. These individuals should be clean, efficient, and detail-oriented. Strong leadership and communication skills and the ability to demonstrate consistent, positive energy is an absolute must. (Ill-tempered chefs or those susceptible to losing their cool need not apply.) Candidates should have the ability to confidently guide and direct kitchen staff. Cost and labor analysis are reviewed weekly so applicants should be comfortable with or very willing to learn the numbers side of kitchen management. Job responsibilities include food cost management, inventory control, schedule writing, and input into creating menu items or daily specials. Strong kitchen skills, technique, and proficiency in all kitchen stations. If interested please email your resume and a paragraph about why you are qualified to the position.